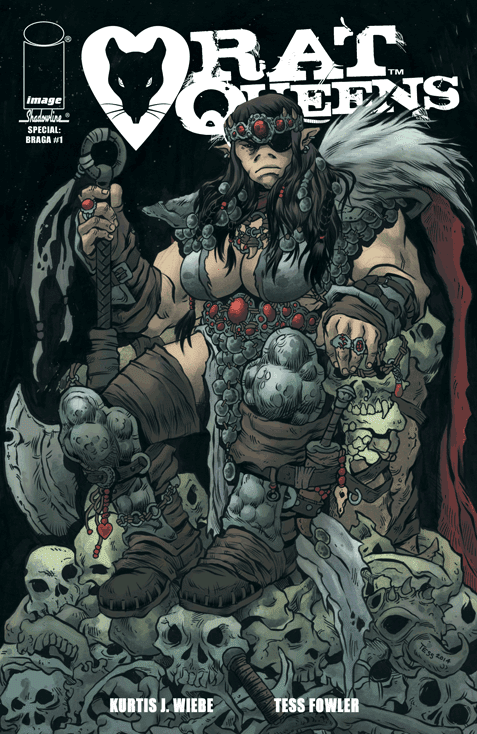 The Fellowship was fortunate enough to obtain a copy of RAT QUEENS SPECIAL: BRAGA#1 from Image Comics. Kurtis J. Wiebe writes, and Tess Fowler draws and colors. This issue introduces us to Braga (we’ve actually met her before – you might recall Betty riding her into battle in issue 5). She tells the story of the firstborn of an orc chieftain, one who doesn’t fit well into orc society. He rejects the leadership of the tribe, preferring the freedom of just being a warrior and discovering who he really is. But one doesn’t walk away from the tribe so easily; it costs him an eye and his family, but he’s now free to be what he was meant to be. This special issue precedes the return of the popular fantasy series, and it gives us a closer look at a very interesting background character (at least so far). And it addresses some relevant social issues along the way (it’s really hard to not spoil this, but you really need to read it yourselves). It’s a solid story, too, and the art really feels good (maybe that’s weird praise, but it just worked for me, okay?). For those of us who are ready for the return of the Queens, this is a wonderful tease. But it stands alone well, too. It’s a good read even for the uninitiated. RAT QUEENS SPECIAL: BRAGA#1 is available now at your FLCS or at imagecomics.com.